Training magazine taps 2015 Training Top 125 winners and Top 10 Hall of Famers to provide their learning and development best practices in each issue. Here, we look at Best Buy’s tips to win in virtual training and Western Union’s strategy for developing people manager capabilities. By David Beck-O’Sullivan, Director, Training, Learning and Development, and Jill Jensen and Jimmy Bayard, Facilitation Managers, Best Buy Co., Inc. Imagine having a company of 125,000 employees who need training, and nearly all of them work in retail environments that don’t allow you to pull them out of their stores. Consistency is needed. Excellence is needed. A newsolution is needed. We faced those challenges at Best Buy, and we’d like to help you navigate some of the challenges we faced in launching our Virtual Training capability. 1. Select a platform. Once you determine that the virtual classroom is the right solution for your organization, you need to select a platform for delivery. There are many platforms out there, all with benefits and opportunities. Spend time understanding what is important to you and your learners and then select a platform that will support the experience you are looking to provide. We chose Adobe Connect. It is economical, had the capabilities we wanted, and is easy to use. Adobe Connect allows for a great deal of customization and interactivity with learners. • Facilitator notes: Scripted notes to ensure key points are landed and recommended things to listen for when asking chat questions to the group. • Producer notes: Specific instructions on when to reveal a poll/quiz, organize breakout sessions, set up and kick off a video or manage any technical issues that come up during the class. • Chat: Cindy Huggett uses the term, “Chatversation,” to describe a conversation that occurs in the chat pod, and we have adopted it. • Video: Watching a video and recapping in the chat pod. • Breakout rooms: Providing a scenario or problem for small groups to solve or share best practices. • Polls: Polling enables you to survey the group and gives you a breakdown of how people respond to questions. This works well as a knowledge check or to find out where the group is trending on a specific topic. • Activities: Many of our classes have a participant’s guide for self-guided activities. They then are given an opportunity to share in the chat pod. • Web links: Allow learners to go to a Website and view an article or piece of information. They then come back to the class and have a discussion about what they saw. 3. Use professional facilitators. Now you need to find the right people to facilitate and produce the training. Look for facilitators who have experience with a variety of audiences and content, and are committed to facilitating highly engaging classes. Your facilitators’ ability to provide feedback and make recommendations to your design developers is vital to constant improvement. Your facilitators also should be engaging enough to keep learners’ attention without being seen. New capabilities also require the need for technical expertise and support. Although classes can be built to be run by just the facilitator, the more dynamic and engaging virtual classes typically are supported by a producer. • The Facilitator is primarily focused on engaging participants in the class and guiding them through the learning process. • The Producer is primarily focused on the participant experience and supporting the facilitator. This means that they are tech support for participants, behind the scenes preparing polls and layouts, clearing out chats, resetting status, reaching out to participants who aren’t engaging, sending out links and files, and even being the co-facilitator. 4. Remember that production value matters. There are many options and levels of investment that will affect the quality of your production. A cheap microphone still will sound cheap no matter how much you try to adjust it. Get a good microphone. After a lot of trial and error, we found that a shotgun condenser microphone run through an eight-channel USB mixer works well. This allows the flexibility to use multiple microphones in one computer and have multiple facilitators speaking in a group discussion. And it costs less than $1,000. We also recommend you invest in putting up sound reinforcement in a quiet room to prevent echo and also to appease people in working areas. Our employees noticed the quality difference when we made these changes. 5. Measure your success. Prior to your first class, first determine which behaviors you are trying to affect and how you will determine if those behaviors materialized. Over the last three years, we have seen the number of learners increase due to the popularity of the capability. In 2015, we will reach more than 10,000 employees with virtual training. We measure eight different areas of excellence after every class and have seen consistent improvement year-over-year. In FY’15, our average NPS (net promoter score) was 4.46 out of 5, and in FY’16, we have improved to 4.56 out of 5. In FY’15, we were able to save the company $630,000 in travel expenses and an additional $120,000 in labor expenses. Part of measurement is benchmarking your success, so if you have best practices to share with us, we’d love to hear them. For more information on our journey or to share your best practices with us, e-mail virtualtraining@bestbuy.com. 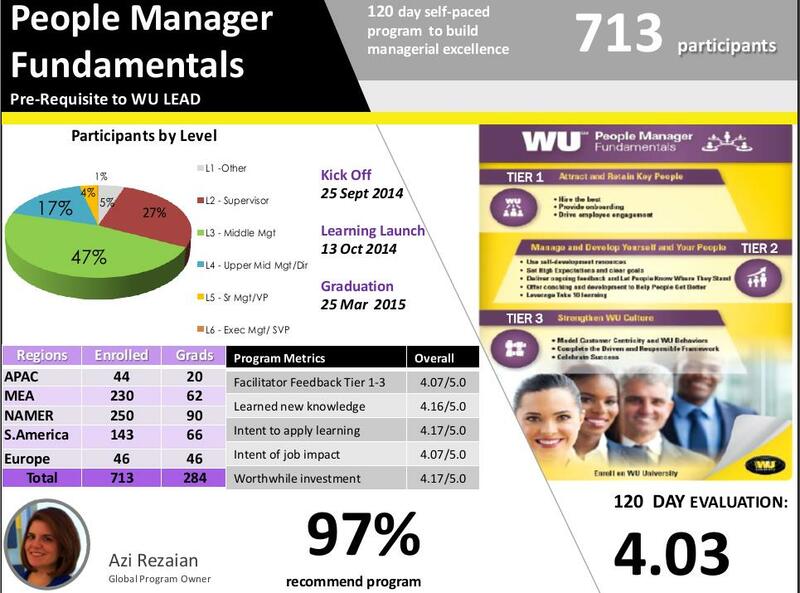 In December 2013, Western Union (WU) designed a strategic approach to enhance people manager effectiveness with the goal of heightening employee engagement and organizational performance. We began by creating a people manager goal to drive more awareness and accountability. This goal was cascaded from the top down (approximately 2,000 people managers) and measured manager effectiveness around setting high expectations, letting people know where they stand, helping people get better, and celebrating success. It also was created to be part of the annual performance review process, rated on a 5-point scale and weighted at 10 percent out of 100 percent goal allotment. 1. 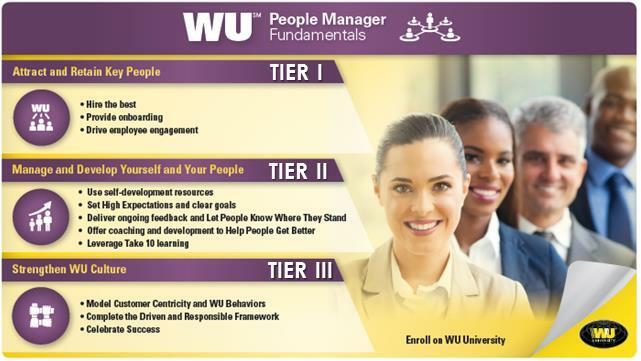 People Manager Fundamentals Resource Guide (March 2014): A Management Resource Guide was assigned to WU people managers outlining various resources related to essential management responsibilities. While this was a quick win for delivering just-in-time learning, the challenge was knowing how people were utilizing this resource. Our WU University system could track completion status by who accessed the resource, yet this did not indicate how effective the learning was and how it was being applied on the job. To address this problem, the team decided to design and develop more instructor-led training (ILT) sessions around people manager topics to measure efficiency, effectiveness, and engagement levels from learning programs (see examples in Nos. 2 and 4 below). 2. Take 10 Learning for People Managers (June 2014- present): Understanding that time is our most precious commodity, a series of people manager topics were designed as 10-minute or less modules for just-in-time blended learning. Available as self-paced, face-to-face, and virtual ILT sessions, the Take 10 learning model proved to be an effective way for delivering weekly ILT sessions that everyone had time to invest in. All content was built in-house with train-the-trainer sessions for ILT sessions to HR leaders and people managers. Live sessions were delivered in different forums, such as staff meetings or lunch & learns. Topics lasted for 10 minutes with some time invested afterward for group discussion. Participants who were unable to attend live sessions could access a 10- minute or less self-paced module through our WU University. Participation from our initial launch (June 2014-March 2015) included 75 percent (1,500) of people managers. The average Kirkpatrick Level 2 score was 4.2 out of 5, and average Level 3 score was 4 out of 5. Some 40 percent of people managers participated in face-to-face global sessions offered. As we designed the initial launch for weekly Take 10 modules, we came across challenges for consistently tracking weekly global activity and attendance. Not everyone could offer weekly ILT sessions, so sometimes content was bundled into an hour on a bi-weekly or monthly basis, which took away the Take 10 effect. In reviewing the program for April 2015 and beyond, we found it best to design and deliver two ILT Take 10 modules a month, while promoting self-paced Take 10 content on WU University. This proved to be an easier way to deliver and track live sessions, while attracting new participants to the program. 3. People Manager Effectiveness Survey (August 2014 and April 2015): To help drive accountability and provide managers with feedback on the people manager goal elements, the team created a bi-annual and anonymous People Manager Effectiveness Survey. The survey provides the opportunity for employees to assess direct manager effectiveness in managing performance and encourages more feedback between the manager and direct report. Our talent operations team first analyzes the survey results. Regional talent consultants then meet with HR business partner client groups to discuss results and learning solutions for areas where there are core strengths and/or high gaps (.10 difference). HR business partners then meet with the senior leadership team to discuss survey results and action planning. Survey results during both years were only summarized and shared at an aggregate level to senior leaders. While overall scores for our pilot program were positive, for the second program launch, we used the feedback to create further enhancements. We kept some of the WU-specific content from each tier and key learning modules, then added a series of 20 mobile app exercises compatible with iPhone/iPad and android devices. Each mobile app exercise is one hour long and provides a brief video lesson with clear learning objectives; a quiz to test participant knowledge; and opportunities for individual practice, role-plays, and peer feedback with program participants, all from their smartphones. Our second launch serves as another pilot for the new learning platform. There can be a high return on investment when developing your people managers. They are the conduit between employee levels of commitment and their day-to-day work, teams, and overall organization, which ultimately drives productivity and retention when engagement levels are high. However, they have a finite amount of time and many competing priorities. The challenge is to create a strategic approach to people manager development, which also takes into account their other priorities. By starting with a people manager strategy that clearly outlined expectations, allowing employees to provide feedback on manager performance, sharing the high-level feedback scores with everyone, and also providing managers with well-designed development opportunities, we strengthened our people’s capabilities and our learning culture in a sustainable fashion. From a measurement perspective, we also achieved our initial program goals of increasing employee and manager engagement.